Making a Murderer is a true crime documentary on a man called Steven Avery. It went live on Netflix on December 18th and has caused a total stir since. Avery spent 18 years in prison for a sexual assault that he did not commit! After 18 years of fighting to prove his innocence DNA evidence was able to have this conviction overturned and he was released from prison in 2003 18 years into his 30 year sentence. Due to this horrendous wrongful conviction Avery was filing a lawsuit against Manitowoc County for $36 million, which he said wouldn't give him the 18 years of life he had missed back but would help get his life back on track. 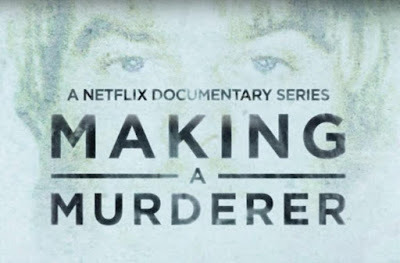 Fast forward to a mere 2 years later, he was charged with a brutal murder of a 25 year old female photographer, Teresa Halbach who's burnt remains were found on his property. In March 2007 he was found guilty of first-degree intentional homicide and being a felon in possession of a firearm. Since his conviction massive petitions have started urging for Avery to be freed. He is still maintaining his evidence and insistent that the county police planted the evidence in an attempt to get revenge for him proving them wrong the first time round. This truly amazing, sad and interesting series can be found on Netflix and I would tell anyone to watch it. It's amazing to see what goes on in the court room and behind closed doors. Steven Avery is still currently in prison serving time for this crime he insists he did not commit. If you've watched it, what are your thoughts? This sounds really good! I haven't watched it but I'm going to have to! Thanks for sharing! This is the sort of stuff my partner enjoys watching so I shall tell him about it. I had to stop watching after I saw Brendan's letter where he says 'p.s my mum thinks you are a nice judge.' It completely broke my heart just how much of a vulnerable kid he was. If you like this, I recommend The Jinx on YouTube, real life murder series in 6 parts following 3 different murders. Really, really interesting! it's awful isn't it! I'll deffo check out the jinx, sounds right up my street!